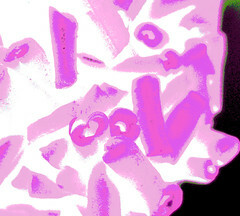 – Cheri’s daughter, Laura said: “Beads or a brain.” I like that girl! The inside lining of some boxed product….my favorite would contain Aunt Annie’s chocolate bunnies. I think it’s the inside of a flower bouquet ! A condom wrapper. Magnum size. Laura says: THANK YOU! 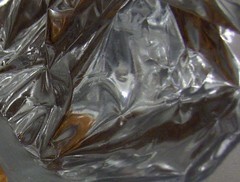 And this week’s photo is a cup wrapped in tin foil. Cheri says: A candy wrapper. It looks like an odd refraction of a diamond or a crumpled up disposable pan. at first I thought it was an ice cube, but don’t recall any silver ice cubes … now? now I think it’s a crystal topper to a decanter of spirits (or something like that). Ohhh…WOW! You snagged a piece of Mork’s coveralls….Shozbot! It’s a bag with a roast chicken inside it. I was thinkin it was an ice cube, or quite possibly a vase of some sort, like the base part. Course I don’t read the post, I look at the picture and guess what it is, and usually I try my hardest not to read the rest of the guesses on my way down to comment. 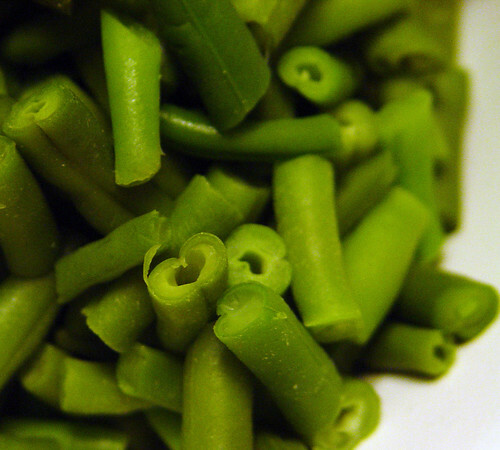 Seriously though, those green beans could’ve been macaroni…. Anyways, my final answer is a glass ornament of some sort! A helium balloon. Without helium?? what makes you think folks don’t read the post before guessing? I don’t read other comments before I post my guess. This looks like some tin foil. The inside of a chip/snack bag? I feel like I’m looking into something. That’s the best I can do right now.